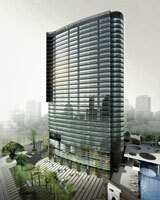 Regal Hotel Group has signed an agreement to manage a five-star hotel in the Chinese city of Chengdu. The 32-storey Regal Master Hotel is due to open in September, and will be loacted on South Renmin Road, around ten minutes’ drive from Shuangliu International airport and 15 minutes from the city centre. The hotel forms part of a mixed-use development owned by the Sichuan Master Group. There will be 350 rooms (measuring an average of 53sqm), as well as several restaurants and bars, a business centre, swimming pool, gym, “games room”, and nine meeting rooms including a 600-sqm ballroom. Regal Hotels Group currently manages two properties in Shanghai and five in Hong Kong, including the Regal Airport Hotel Hong Kong, winner of Best Airport Hotel at last year’s Business Traveller Awards (see online news September 2, 2008). For more information visit regalhotel.com.